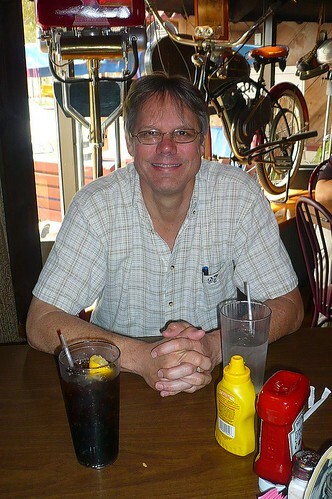 Yesterday we stopped at our favorite beachfront restaurant, the Ocean Deck, for some lunch. I had the Mahi sandwich but asked for it as a wrap to save some carbs, ate half of it along with a few fries. Now, Beren didn't worry about saving fat/carbs/calories, he chose the Monte Cristo. Take a look at this thing after Beren finished it! Yeah, this is the half that was still left over! What a monster, right? From a bit of research on the 'net, I've determined that this baby weighs in at somewhere between 600 - 1,000 calories, depending upon who's counting. I have no idea about the fat but with all the gooey cheese and the fact that it's deep fried, am sure the numbers are staggering! Anyway, he thoroughly enjoys it and it's not something he has every day so I encourage him to go for it! Of course it's not all about the food, Daytona Beach provides other..uh...treats as well! Despite the 40 degree weather, this hunky surfer braved the cool weather in order to run down the beach. mmm...yummy! After lunch we headed to Main Street for some live music at Boot Hill Saloon where we encountered biker babes of every shape & size. This gal especially impressed me, love the B*I*T*C*H anagram on the back of her shirt! Now, Boot Hill is one of the bars where ladies are invited to shed their undergarments should they feel so inclined, then the bar will "display" them. I myself have never participated because I like my pretty underthings too much to share them! And speaking of pretty things, how about this corset top that I just had to buy from a streetside vendor? Isn't it adorable?? It was too cold to wear outside but Beren enjoyed it anyway. 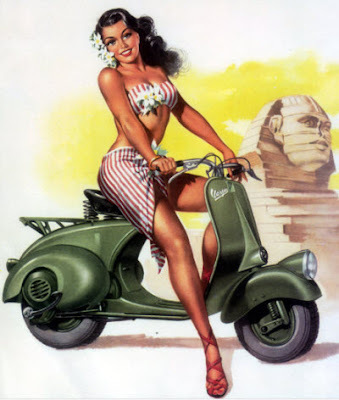 Ok, this biker wanna-be has to run now, time to hop in the convertible and head out for another afternoon of fun. See you later! Yesterday was a dreary day in Ormond, a bit chilly and overcast. Beren and I intended to go out for some live music & cocktails in the evening, but in the meantime I figured I'd spend my morning in the kitchen. Cook first five ingredients until onions are soft. Add tomato puree, tomato paste, and Worcestershire sauce. Add meat, browned in fat. Slowly simmer 3 hours. 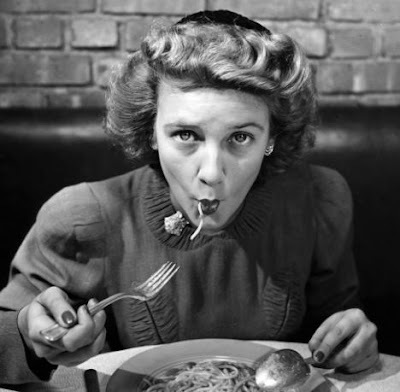 Cook spaghetti in boiling, salted water; rinse in hot water; drain. Place on warm platter; pour over sauce; sprinkle with grated Parmesan cheese. Per Serving (excluding unknown items): 831 Calories; 30g Fat (32.1% calories from fat); 29g Protein; 114g Carbohydrate; 9g Dietary Fiber; 64mg Cholesterol; 1089mg Sodium. Oh, heavens! Butter plus oil plus fat plus beef? Look at those calories and fat grams! Whoa! So, here's what I did. First, delete the butter and most of the olive oil. Using a nonstick pan eliminates the need for so much grease. 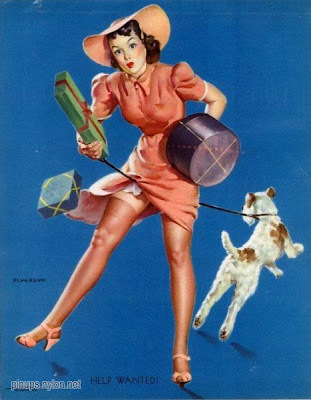 I understand that Teflon wasn't used yet so homemakers had little choice, fortunately we have more options nowadays! Also, when I started chopping the onion I realized that their "medium" sized onions might not be as large as we have today so I cut that amount in half which was the perfect amount. Of course I used veggie crumbles instead of beef, and Ronzoni Smart Taste® pasta to make it a bit healthier. 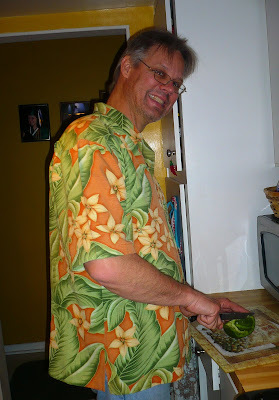 Then, when everything was blended nicely, I used my slow cooker to simmer all day while Beren and I went out to play! Per Serving (excluding unknown items): 129 Calories; 2g Fat (14.2% calories from fat); 5g Protein; 27g Carbohydrate; 6g Dietary Fiber; 0mg Cholesterol; 983mg Sodium. The Verdict: Well, first of all, while this sauce had a very nice flavor, it was a bit thick for my taste. Next time I'll probably add another can of puree just to think it out a bit. Also, this would make 8 very generous portions! I only cooked 1 pound of pasta and it served 4 of us with at least another serving leftover! Overall, a really easy dish and definitely one I'd make again! Now I am suppose to pass this on this on to 15 other blogs and tell you 7 things about myself. 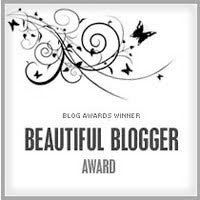 I'm going to break the rules just a bit and pass these awards on to all of you who visit 'cause I think you're all Beautiful Bloggers! Here are 7 random things about me, would love to read the same about you so please leave me a comment so that I can visit your Beautiful blog as well! *I saw Elvis Presley perform, on my 6th birthday. One of the best birthday memories ever! I still remember standing up on the chair, my mom holding onto me, watching the King rock & roll across the stage! *I am terribly claustrophobic. I didn't know this until I was 26 years old and had an MRI. Bad, bad way to find out! *I can't think of a vegetable I don't like. Seriously. Even beets. They're all wonderful! Of course, if I ate more of then and less of the other stuff I wouldn't have a weight issue now, would I? *Up until I was about 11 years old I had short hair. Super-short, as in Pixie. My mother wouldn't let me grow it long until I could take care of it myself. I am still rebelling. 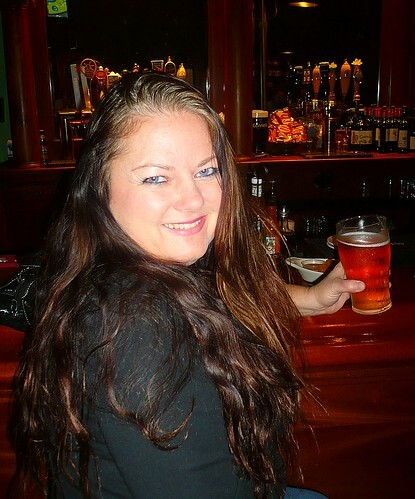 *At 26 years old I a had a cancer scare that rocked my world forever. (Hence the reason for the MRI, see above). I'll post at length about it one day but suffice it to say that getting a death sentence at that age with three babies at home is not a good thing. Thanks again, Jules, this was a lot of fun! Well, my little road trip is over, back to the grind. Beren and I had a lovely time, so glad we were able to get away for a bit even if it was work-related. Here's a little story for you. When I was pregnant with my first daughter, Kali, I was 19 years old and about 105 pounds. I know, ridiculous, right? I had a really easy pregnancy, thank goodness, never got really sick or anything. However, I had the strangest craving - for lemons! I would slice them, sprinkle salt on top and devour them! It makes my mouth pucker just to think about it but that's what I did. Friends have speculated that the citrus might have helped keep the nausea at bay and they might be correct, all I know is they didn't prevent me from gaining 50 pounds! Anyway, all these years later I still enjoy lemon in anything/everything, so when Beren and I stumbled upon this adorable Italian restaurant yesterday I knew we had to try it! (sorry for the fuzzy picture which really doesn't do it justice, my phone camera is not the best). Trattoria Limoncello which means Lemon Kitchen. Isn't that adorable? My own kitchen at home is similar, yellow & blue with a Mediterranean feel so I was quite at home! 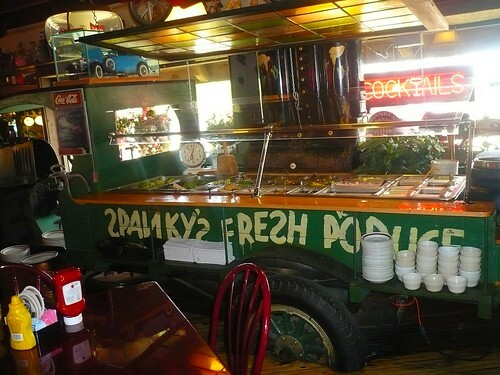 And, oh, my the food was just as wonderful as the atmosphere! 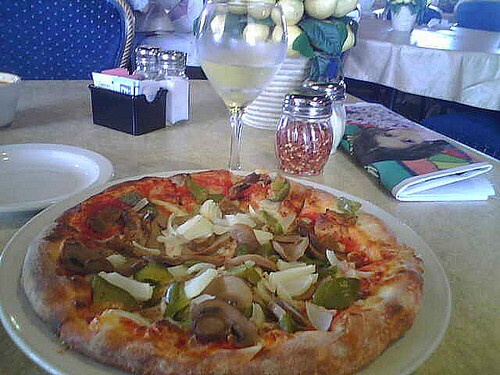 I had a "personal" vegetarian pizza which ended up being enough for both lunch and dinner. As you can see, typical of most Italian restaurants, the portions were huge! Beren will be enjoying his leftover calzone for lunch today, lucky guy! Even after all of that "white stuff," and with the arrival of my moontime this morning, I got on the scale to find that I have lost another .08 pounds. Ok, not a ton for sure, but almost a pound with eating & drinking as much as I did was not bad! How did this happen? I did some thinking and really feel that it's portion control along with lack of snacking. When I'm in Ormond, we're so busy that I don't snack much. Same with the past couple of days being out of town. We have 3 square meals and that is it. I wonder if my metabolism is just not responsive to the often-recommended 5 or 6 mini-meals? I'm going to continue on this way as best I can, it's harder to do while at work, I tend to get bored and reach into my desk drawer for a little mid-morning or afternoon snack but I'll see how it goes and will let you know how this experiment turns out. How about you all? What works for you? I'm playing the "corporate wife" for a couple of days, even thought I'm not exactly a wife and Beren is not actually a corporate big-wig. *grin* You see, his job sometimes requires a bit of traveling, just across the state, and I always manage to tag along. Even if we're just staying at a Hampton Inn in some podunk town, I am still in a hotel room, with My Man, alone. While he's at meetings and such, I enjoy long luxurious hours to myself reading, blogging, watching movies, lounging by the pool, using the hotel fitness center, etc. Sometimes I drop him off at his destination and take the car to go shopping or exploring, maybe get a pedicure as I did yesterday. It's heavenly! The only real downside of the whole thing is the dining experience, or lack thereof. You all know how much I enjoy cooking and honestly am not a big fan of eating out. When I do, it's for a special occasion or out of necessity. For the most part, I prefer my own cooking! Even though I'm not gourmet or always fancy, I know what ingredients I'm putting on my table and into my mouth! When traveling, however, I'm obviously at the mercy or whatever restaurant we happen upon. Often this can be a wonderful thing as we've discovered some really great little treasures, but sometimes not so much. Yesterday was a good example of both experiences. For lunch, I was determined to find a local restaurant, did not want the same old chains we have at home. After driving all over Naples, testing Beren's patience and running out of time, we finally found an adorable little place that was well worth the effort, Spanky's Speakeasy. The decor was adorable, I was entertained just looking around at all of the antiques, posters, etc that adorn the walls. Everything was spotlessly clean including the ladies room, a biggie for me! Being mostly-vegetarian, my meal choices were a bit limited. Other than salad, there wasn't much on the menu that didn't include meat. 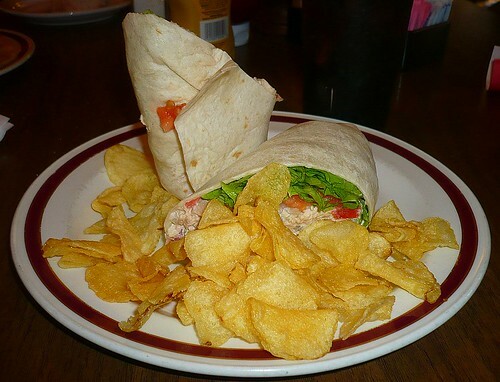 Though the salad bar looked great, I was in the mood for a sandwich so I settled for the tuna salad, asking them to make it into a wrap. No problem there but when I requested a substitution of fresh fruit for the potato chips I was told it would cost $2.00 extra! I'm not cheap but I thought that was a bit much so I declined. Beren had the rib special which came with steak fries, $8.00. He said that while they weren't the best ribs he'd ever had, they were good and the price and portion size was perfect for a weekday lunch. My sandwich was adequate, typical tuna salad, nothing special, but it was a generous size and I found myself taking half of it to go. Overall, a good lunch time experience. I would like to see more health-conscious items on the menu but I understand that this is a deli-type place and not catering to the crunchy crowd. We peeked into the bar area on the way out, would love to come back for cocktail hour another day! Uh-oh! Now what? Well, the doors were wide open with people inside so we decided to go in anyway. 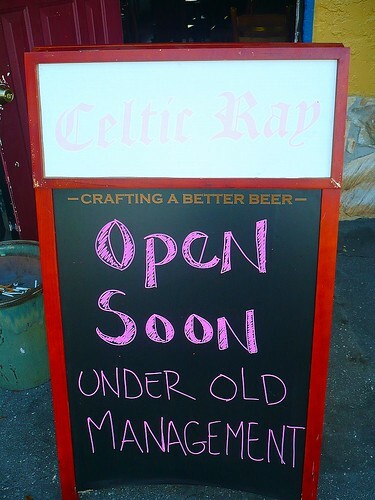 It turns out that the original owner, Kevin Doyle, had re-acquired his bar and it was supposed to officially re-open yet there was a glitch in the system which caused a delay. Not one to turn away friends/patrons, Kevin opened the doors and served beer, wine & chips for free, just requesting a small donation if you were so inclined. Beautiful! 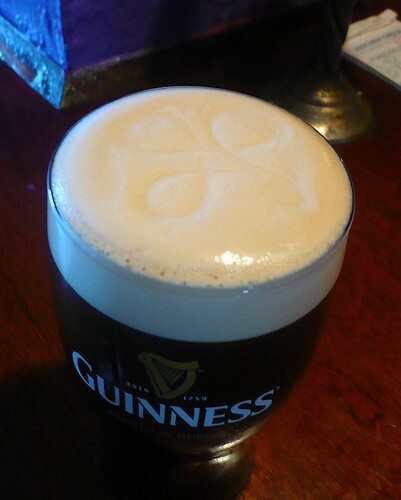 We shared a pint with Mr. Doyle and got the scoop on what had happened to him since we'd been gone, what a story! Since dining at the Ray was not an option but we were still craving some Irish grub, Kevin lead us to the next best thing, a pub called the Ice House Pub. While we enjoyed the meal, the fish & chips were not quite as good as expected (again, I only hate half) and the atmosphere was much too loud & busy so we headed back to the hotel for the night. So, that's where I am now, lounging about in the room while Beren fulfills his work obligations. He'll be back by noon when we'll check out and head to lunch, stay tuned! 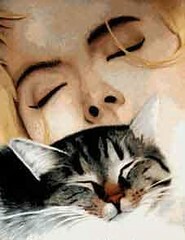 It's a lovely, lazy day here at the Castle as we are recuperating from my daughter's 20th birthday party. *smile* In between post-party clean-up, Beren and I are watching movies, doing laundry, etc, just a perfect Sunday afternoon. Cook onion and green pepper in a little hot fat till just tender. Add meat; brown lightly. Add next 8 ingredients. Simmer 20 to 25 minutes, until thick. Add cheese; stir till melted. Pour into greased 10x-16x1-1/2-inch baking dish. Make Corn-Meal Topper: Stir corn meal and salt into cold water. Cook and stir till thick. Add butter; mix well. Spoon over hot meat mixture in 3 lengthwise strips. Bake casserole in moderate oven (375°) about 40 minutes. Per Serving (excluding unknown items): 480 Calories; 30g Fat (54.1% calories from fat); 20g Protein; 36g Carbohydrate; 5g Dietary Fiber; 80mg Cholesterol; 1817mg Sodium. This was a very simple Redux and look at the calorie/fat reduction! I decided to leave the butter in w/the cornmeal as it only added 7 calories and really makes a difference in taste to me. Please note: I am using the Mastercook recipe program to tally nutritional information then plugging those numbers into the online WW calculator to determine POINTS. While I believe it to be accurate, please feel free to do the math yourself in your own way. Cook onion and green pepper in a nonstick skillet that has been lightly sprayed with olive-oil-flavored cooking spray, just until tender. Add Boca crumbles until just defrosted, then add 7 ingredients. Simmer 20 to 25 minutes, until thick. Add cheese; stir till melted. Pour into greased 10x6x1-1/2-inch baking dish. Make Corn-meal Topper: Stir corn meal and salt into cold water. Cook and stir till thick. Add butter; mix well. Spoon over hot mixture in 3 lengthwise strips. Per Serving (excluding unknown items): 247 Calories; 7g Fat (25.2% calories from fat); 12g Protein; 37g Carbohydrate; 6g Dietary Fiber; 11mg Cholesterol; 1391mg Sodium. The Verdict: We all really enjoyed this but thought it could use some sour cream and a bit of cheese for garnish, will definitely try that next time. I need a show of hands, how many of you ladies out there love shoes? I mean, seriously, completely adore them to the point where you are nearly breathless when walking through a shoe store? And, if this describes you, how many pair do you own? Come on, I'll fess up if you do! Here goes: at last count I had over 40 pairs of heels. Does that sound like a lot? I mean, not by Imelda's standards of course but as compared to the average woman? I apparently don't think so because I continue to add to my collection every chance I get. It's at the point now where Beren doesn't even try to fight my addiction, he actually directs me to shoes he thinks I'd like, lol! I paid $5.00 for these babies, purchased brand new from one of my favorite thrift stores in Daytona. And how about these adorable polka dot peep toes that I wear all the time? These are also by Delicious, picked them up for a song on e-bay. 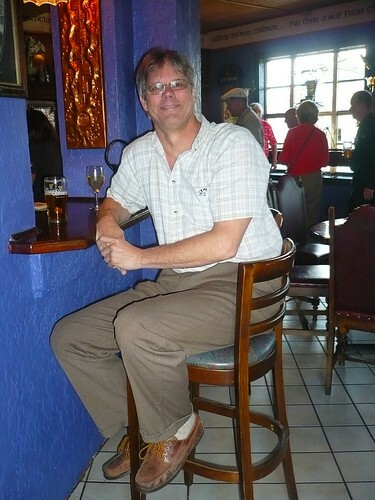 As you can see, there is no heel high enough or thin enough for me! Being only 5'2", I have worn heels all my life and feel more comfortable in them than in flats any day. Ugh, I don't normally work on Fridays and really look forward to that whole day to myself when the rest of my family is at work/school! 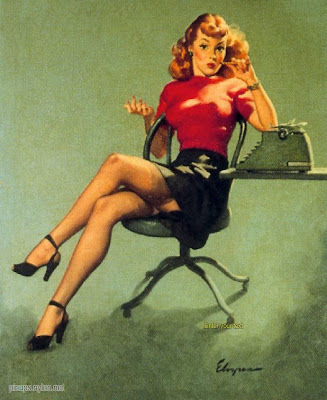 I get so much done, cleaning and generally puttering around the house, and usually find an hour or two of "me time" to read, watch a movie, whatever. Well, since I'll be out of town on Monday & Tuesday (more about that later), I needed to go in and make up those hours. So..I put on some cute shoes for consolation and trudged into the office. Knowing that I wouldn't feel like cooking once I got home, I threw this little soup into the crockpot before I left. 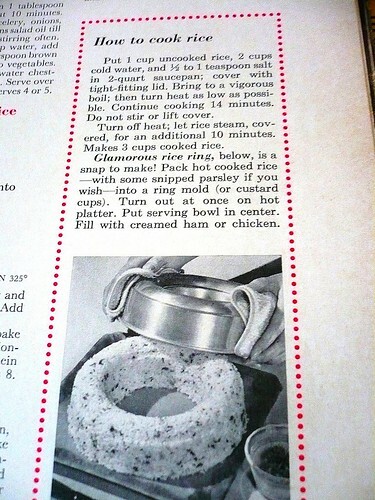 The original recipe is from My Better Homes and Gardens Cookbook, copyright 1938. Brown meat in fat; put all ingredients except potatoes in large kettle and simmer slowly, about an hour. Add potatoes and continue simmering 1 hour. Serve with toast or cracers as main dish for luncheon or supper. Per Serving (excluding unknown items): 366 Calories; 27g Fat (65.4% calories from fat); 15g Protein; 17g Carbohydrate; 3g Dietary Fiber; 70mg Cholesterol; 909mg Sodium. Appx 9 WW POINTS. Put all ingredients except for rice in slow cooker; cook on low for 4 - 6 hours or until vegetables are tender. Add rice about 15 minutes before serving. Per Serving (excluding unknown items): 103 Calories; trace Fat (3.8% calories from fat); 3g Protein; 23g Carbohydrate; 3g Dietary Fiber; 0mg Cholesterol; 148mg Sodium. Appx 1 WW POINT. The Verdict: While this was a bit bland for my taste, it was still a healthy, filling soup and a lovely to meal to find waiting after a long day! I would definitely make it again, any ideas about how to flavor it up just a bit? I got up early this morning and decided to take my "grand dog" for a little walk. I figured a bit of exercise would be good for us both, and it might be nice to have some company as I perused the neighborhood. Well, apparently Lucy and I do not share the same vision of a "walk" because in her opinion it's simply not worth her time unless she's zigzagging across the sidewalk at breakneck speed, me flying along behind in an attempt to keep up! By the time we returned home 30 minutes later I was out of breath and ready to flop on the couch yet she was barely winded! I swear, if I put that leash on her she'd be ready to go again! Me, not so much. Did I mention that our dear Lucy is part greyhound? So, after that productive workout and a morning at the office, I was looking for something easy for dinner tonight. I also felt like adding some spice to my life today (when don't I?) 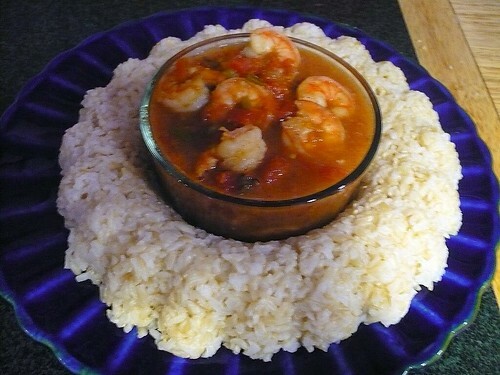 so I dug around and found this delicious creole recipe my Better Homes and Gardens New Cookbook, copyright 1953, 1962. Cook onion, celery, and garlic in hot oil till tender but not brown. Add tomatoes, tomato sauce, seasonings. Simmer uncovered 45 minutes. Mix cornstarch with 2 teaspoons water; stir into sauce. Cook and stir till mixture thickens. Add shrimp and green pepper. Cover; simmer til done, about 5 minutes. Per Serving (excluding unknown items): 165 Calories; 8g Fat (42.9% calories from fat); 13g Protein; 11g Carbohydrate; 2g Dietary Fiber; 86mg Cholesterol; 1001mg Sodium. Exchanges: 0 Grain(Starch); 1 1/2 Lean Meat; 1 1/2 Vegetable; 1 1/2 Fat; 0 Other Carbohydrates. Appx 4 WW POINTS. Saute shrimp with garlic in a nonstick pan lightly spritzed with olive-oil flavored cooking spray, just until pink. In the meantime, combine tomatoes, chili powder, cornstarch & Worcestershire in a large saucepan. Simmer until thickened & bubbly. Combine shrimp & tomato mixture, blending well. Add Tabasco just before serving, if desired. My family found the dish quite spicy enough without it! Serve over rice, making sure to count the additional calories/POINTS. Per Serving (excluding unknown items): 85 Calories; 1g Fat (14.6% calories from fat); 15g Protein; 2g Carbohydrate; trace Dietary Fiber; 115mg Cholesterol; 139mg Sodium. Exchanges: 0 Grain(Starch); 2 Lean Meat; 0 Vegetable; 0 Fat; 0 Other Carbohydrates. Appx 2 WW POINTS. Oh, and of course I served it over 1/2 cup of healthy brown rice instead of white for the same 2 POINTS value. Happy Hump Day, dear friends! Ugh, did I really just get back to work yesterday and there are three more days til the weekend? Sigh. Tax season at an Accounting office, need I say more? The only thing that keeps me going some days is the promise of getting up and putting on a cute dress and heels, I swear! Ok, I worked up another Retro Recipe Redux for you, this time Meat Loaf, a dish that surely graced most of our family dinner tables over the years! I haven't prepared this one yet so I'll save my verdict for this evening, perhaps someone would like to cook it along with me? We could don our pretty aprons, pour ourselves a cocktail and giggle our way around my kitchen. What do you say?! The original recipe is from The Modern Family Cookbook by Meta Given, copyright 1942, 1953 and 1958. Combine the 3 meats thoroughly in a large mixing bowl, then work in the bread crumbs. Beat eggs well, add onion and other seasonings and mix well. Add to meat and stir or knead until blended. Pack firmly into a buttered loaf pan, then unmold onto a flat baking pan. Bake in a moderate oven (350 F) 1-1/2 hours or until well done. Per Serving (excluding unknown items): 385 Calories; 26g Fat (62.9% calories from fat); 27g Protein; 8g Carbohydrate; trace Dietary Fiber; 151mg Cholesterol; 753mg Sodium. Exchanges: 1/2 Grain(Starch); 3 1/2 Lean Meat; 0 Vegetable; 3 1/2 Fat. Appx 10 POINTS. NOTES : Unmolding the uncooked loaf and baking it on a flat pan produces more brown crusty surface. However, loaf may be baked in the loaf pan, without unmolding, if preferred, but let cooked meat loaf stand in pan 15 to 20 minutes before unmolding so meat can absorb all juice. Lightly saute onion. Defrost crumbles slightly. Mix all ingredients together except for ketchup, bake at 350 for 45 minutes. Top with ketchup, bake for 15 minutes more. Allow to set for a few minutes before slicing and serving. Per Serving (excluding unknown items): 81 Calories; 1g Fat (9.0% calories from fat); 4g Protein; 15g Carbohydrate; 1g Dietary Fiber; 0mg Cholesterol; 1018mg Sodium. Exchanges: 1/2 Grain(Starch); 0 Lean Meat; 0 Vegetable; 0 Fat; 1/2 Other Carbohydrates. Appx 2 POINTS. The Verdict: As you can see, I tweaked the original recipe a bit, found that 2 packages (24 ounces) of veggie crumbles provided a nice sized meatloaf and served my family of 6 perfectly. Because we like ketchup on our meatloaf, I added that as well. I served this alongside bread, scalloped potatoes (from a box, I cheated!) and veggies. Delicious, especially considering how many calories and fat we cut! Wow!!! I got up early this morning and stepped on the scale with trepidation, nervous about how all the pizza and rich Valentines Day dinner would impact the numbers. WHAT? What? How is it possible that I lost 3 pounds this weekend? Could that daily walking have had that much impact? Or maybe I didn't snack as much? I'm going to do some thinking about it today, try to figure out what I did right over the past few days and how I can continue doing so! It's Pizza Night at the Castle but I truly think I've had enough of the gooey cheesy stuff for a while. Instead I'm going to prepare myself a big salad with some shrimp, feel like I'm low on my veggies and this should do the trick. With a POINT value of only 1, I'll be able to enjoy a glass or two of chardonnay during happy hour. Oh, and my black feline Jezebel will also be pleased because she always gets a bite or two of shrimp. Spoiled? But of course! We all love grilled shrimp, but who's ever heard of grilling lettuce? Actually, it comes off the grill sweet and lightly wilted, just waiting for the dressing. Toss the shrimp, oregano, thyme and garlic powder together in a medium bowl. Cover and refrigerate at least 1 hour or overnight. Cut the head of romaine in half lengthwise, leaving the root end intact, so that the leaves on each half are held together by the root. Cut the radicchio in quarters, lengthwise, leaving the root end intact, so that the leaves on each quarter are held together. Lay the shrimp on the grill or in the pan. Cook until pink and firm, about 3 minutes, turning once. Transfer to a serving bowl. Spray a wad of paper towels with a nonstick spray and wipe the grill rack or grill pan quickly, being careful not to burn yourself. Add the lettuces cut side down. Pressing down with the back of a large metal spatula or a small saucepan lid, cook until slightly wilted and marked from the grill, about 30 seconds. Transfer the Romaine to a cutting board. Flip the radicchio quarters to the other cut sides; grill 20 seconds more. Transfer to the cutting board. 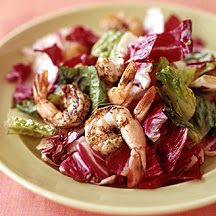 Roughly chop the romaine and radicchio; add it to the bowl with the shrimp. Toss with the vinegar, salt and pepper. Serve at once. Yields about 1 1/2 cups per serving.